We are leaving tomorrow to go into a tribal location, called Gegering, for a month. This is part of our orientation here, and Gegering has an established church plant, so it should be a safe experience. We have already learned many ways of preparing for "going bush" that will help us in the future. One thing was planning food for the month. Whatever we bring in is all we'll have besides food from the people which consists mostly of sweet potato and greens and some fruit. Also, we tried to pack wisely because we pay for weight on the flight in. 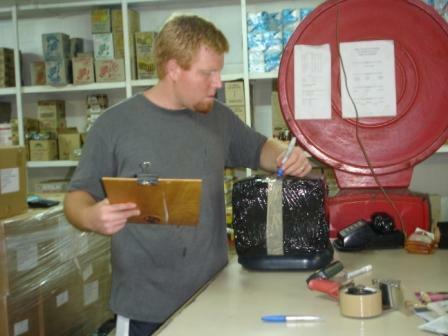 Here is Jonathan weighing a box that has been wrapped in black plastic. We will have a 2 1/2 hr boat ride and then a 3 hour hike into the village, and for the hike we will have people carrying our things. We've wrapped our stuff in this plastic so no one will know what we're taking in... hopefully making things less tempting to steal. that we would have an overall good time fellowshipping with these tribal believers. We would love to hear from you through email while we're in there, but it will be received through a radio modem so please don't send any larger than 100kb. We will be back March 8, and I'm sure we'll be excited to post and show you pictures from our bush experience! We are excited to share with you some new steps the Lord has directed us to take since arriving here in September. Many of you know that when we first came to PNG in September we weren’t sure what the Lord had in store for us as far as who we would partner with or which tribal location we would work in. Well, after months of praying and waiting on the Lord, He has given us direction! He has led us to join two other families and begin a new work with them among the Siar people. 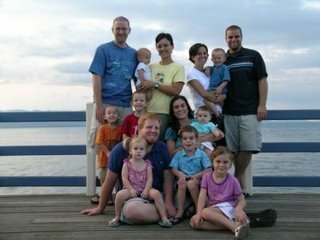 We will be working with Lane and Karrie Sanford and their 3 boys, Landon, Kade, and Luke, as well as Chris and Erin Lujan and their son Ethan. Both of these families have been here since June 2006 studying the national language and culture. 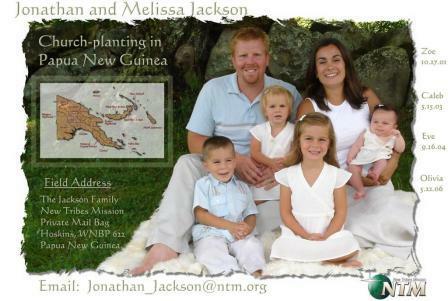 They too have been seeking God’s leading in where to work here in Papua New Guinea. At the beginning of December a survey of the Siar people was done on New Ireland which is an island east of New Britain (where we live now). Four missionaries, including Lane Sanford and Chris Lujan, went to visit the Siar people group to see if the door was open for missionaries to go there. In Kabaman, one of the villages on the survey, the village leaders are saying that they are all in agreement on this: They want missionaries to come and live with them, teach them, and translate the Bible! Because of the open invitation, among other factors, Kabaman is where we will seek to locate and begin the incredible job of planting a church! A follow up survey is planned for February 20th. Lord willing, at this time a land agreement will be signed for 3 missionary houses to be built there. In these next few months there are many plans and preparations to be made that include buying supplies for house building, coordinating building teams, visits into Kabaman, and team meetings. All of this will take place as while we are still in language study! Thanks for praying with us in these things.